Omocha-e - Omocha-e are toy prints, encompassing a wide range of woodblocks designed for play or learning. 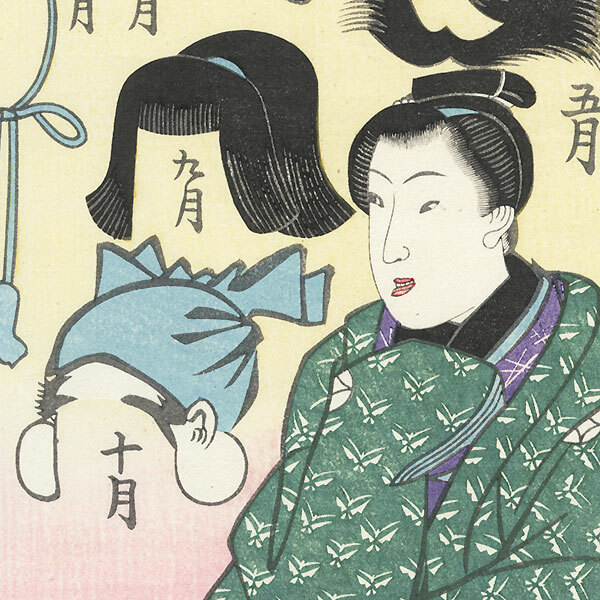 Omocha-e became popular with both children and adults in the late Edo and Meiji eras. Subjects range from games, puzzles, and paper dolls to groups of household furnishings, articles of clothing, or wigs, along with construction toys to cut out and build. Others can be folded to create small booklets, or double-sided cards or paper dolls. Many feature wonderful detail or bright color. These attractive and fun prints are an interesting choice to collect or display. 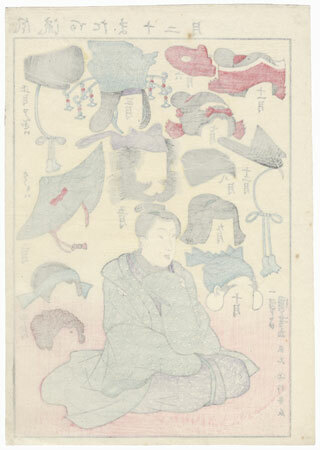 December - Unusual omocha-e or toy print depicting a seated young man surrounded by wigs, hats and headdresses, each numbered from 1 to 12. Near the top is a red tengu mask with a long nose, next to a beauty's wig topped with an elegant crown. 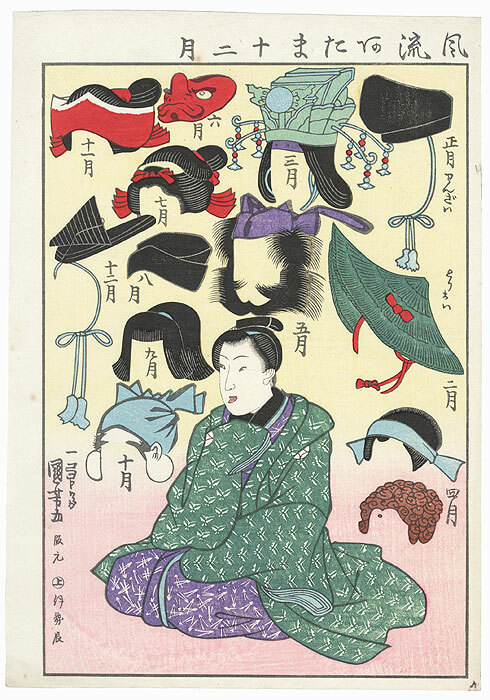 A red curly-haired wig is shown at lower right, and the wig just above the boy's head is for Shoki, the demon queller, complete with wild whiskers and a Chinese cap. A fun and interesting subject. Condition - This print with excellent color and detail as shown. A few small spots and light creases. Please see photos for details. Good overall.